Qimpro Awards recognize individuals for Excellence in Quality. The awards were established in 1990. The Qimpro Platinum Standard recognizes Statesmen with national and international footprints in Quality. The Qimpro Gold Standard recognizes Leaders who have integrated Quality into their strategic plans. This year, a Legacy award has been introduced. The QIMPRO GREEN LEGACY AWARD is for Green Practices adopted by a Family over multiple generations. 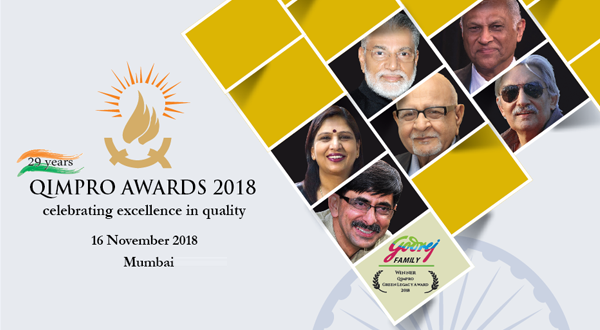 The QIMPRO GREEN LEGACY AWARD 2018 is being presented to The Godrej Family. Well deserved. Congrats to the well deserving personalities to achieve the prestigious recognition for their contribution to Quality.